Friday December 8th 1893 I got my morning work done and Leonad who was cutting wood in the yard washed for me. I put in the afternoon after a late dinner cleaning the kitchen, porch and dining room. I took down the clothes and in the evenings got them ready to iron and bread made up. It was cloudy in the morning but proved a nice day. 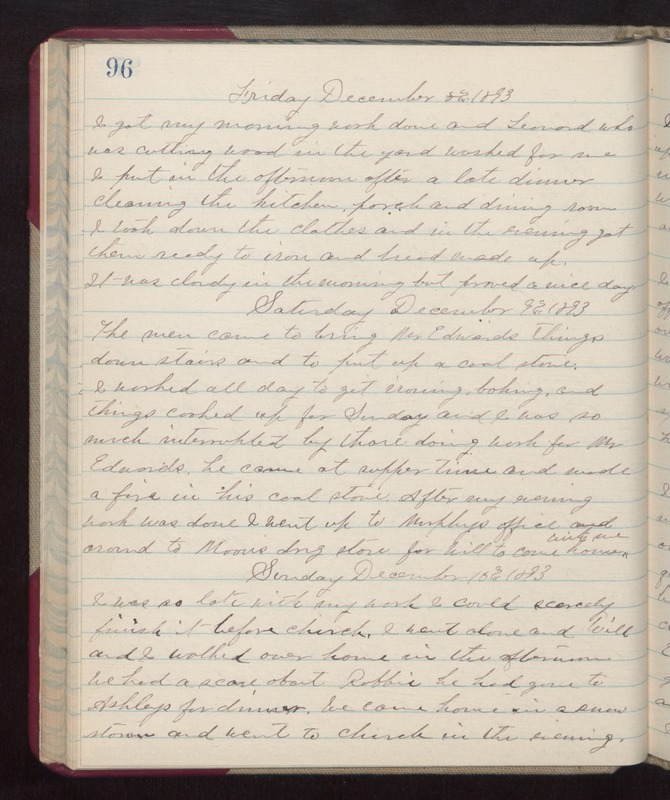 Saturday December 9th 1893 The men came to bring Mr Edwards things down stairs and to put up a coal stove. I worked all day to get ironing, baking, and things cooked up for Sunday and I was so much interrupted by those doing work for Mr Edwards. he came at supper time and made a fire in his coal stove. After mu evening work was done I went up to Murphys office and around to Moons drug store for Will to come home with me. Sunday December 15th 1893 I was so late with my work I could scarcely finished it before church. I went alone and Will and I walked over home in the afternoon. We had a scare about Robbie he had gone to Ashleys for dinner. We came home in a snow storm and went to church in the evening.